The search for a missing girl leads private investigators Elvis Cole and Joe Pike into the nightmarish world of human trafficking in this #1 New York Times bestseller from Robert Crais. When Nita Morales hires Elvis Cole to find her missing daughter, she's sure it's a ruse orchestrated by the girl and her boyfriend. She's wrong. They've been taken by bajadores—border bandits who prey on the innocent by buying, selling, and disposing of victims like commodities. 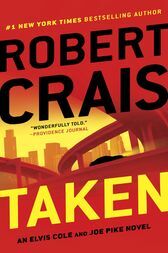 Robert Crais is the #1 New York Times bestselling author of more than twenty novels, many of them featuring private investigator Elvis Cole and his laconic ex-cop partner, Joe Pike. Before writing his first novel, Crais spent several years writing scripts for such major television series as Hill Street Blues, Cagney & Lacey, Miami Vice, Quincy, Baretta, and L.A. Law. He received an Emmy nomination for his work on Hill Street Blues, and one of his standalone novels, Hostage, was made into a movie starring Bruce Willis. His novels have been translated into forty-two languages and are bestsellers around the world. A native of Louisiana, he lives in Los Angeles.